As is our custom, Becky and I keep journals while we are on our mission trips. While we are here in Utah, I will try to post our journals and keep you updated as well as I can. The little city of Manti has Wi-fi access so I can actually journal in my tent. How cool is that? Becky is much better at actually finding time to write, so most of this will be from her. I am doing the best I can in keeping up with the demands of leading our team so I am going to journal a little differently than I have in the past. Rather than write out the whole day’s events, I will just list events and then give a little commentary on some of the more interesting things. I will post what I have of my journal and then give you more details with Becky’s journal. You can click on the pictures to see an enlarged version of them. Here is what I have written so far. Up late packing. Hoping that we do not forget anything. Got to bed close to midnight. Got up at 4:30 to get ready. Our flight leaves at 6:30 am. Lines at the airport are longer than we have ever seen. Got on board with no time to spare. We didn’t even get pictures of the team before the flight. Arrived in SLC a little after 10:15 am. The Rent-a-wreck people picked us up and James Lorenzen met us at the airport. Had lunch at Jason’s Deli. Good food. The weather here is cooler than normal for this time of the year. There is plenty of snow still on the peaks. Went to temple square to do our tour. Our team split up and talked to different LDS missionaries. Rosanne and Shayla had one, Becky another, Jim talked with a number of missionaries and James talked with a senior missionary. Some Mormons who are retired will go on a mission for 18 months. I took pictures and joined James for a bit. After our conversations, we went to the LDS history museum, but Becky stayed on temple square and worked on her presentation for Thursday morning. She will be presenting at Ephraim Church of the Bible. 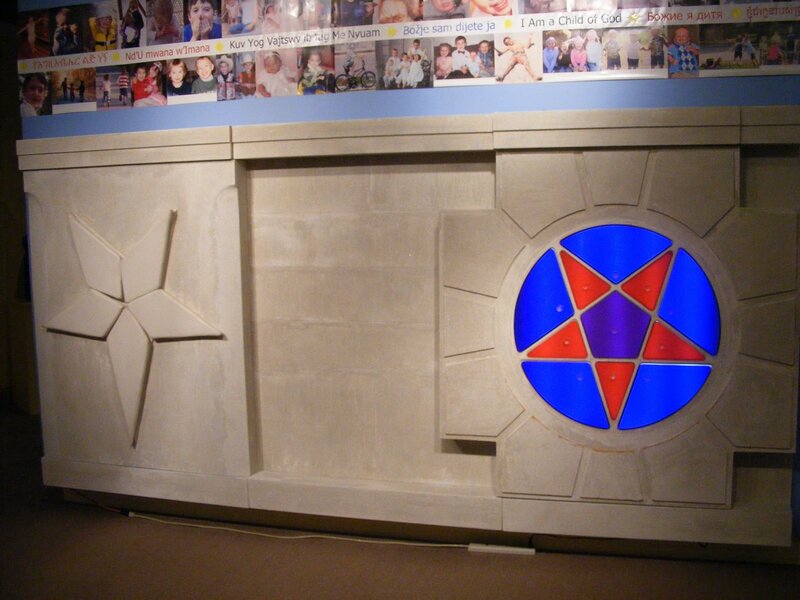 We wanted to show Jim, what we affectionately call, “the pentaplays.” As you can see from the picture, it is a pentagram in a children’s area. Isn’t it nice that the LDS Church provides some pentagrams for the children to color? With all of the symbols that children could color, why the pentagram? They could color Jesus, a cross or even Moroni, but why pentagrams? After our tour, we ate at the Reverend Dave Roberts’ house. While there, we met up with another team of Christians from San Diego, CA. Dave is a charismatic, evangelical, Anglican priest. The great thing is, he is a Christian. We ate stuffed peppers and then had a communion service. After dinner we went over to Bill McKeever’s house to sleep. Bill McKeever is the founder of Mormonism Research Ministry. He has a great web site http://www.mrm.org/ and is one of our missionary heroes to the LDS people. Every one else went to bed, but Bill and I stayed up until about 12:30 talking and working on our computers in his office. Everything with our flights went smoothly and we all successfully met up in the SLC airport with all our baggage arriving on time and no problems whatsoever. After James picked us up and we got our rental vehicle, we went to Jason’s Deli for lunch and then made our way to Temple Square. I asked Keith to drop me off right in front while they parked the vehicles so I wouldn’t have to walk, and this gave me time to go in by myself for a little while and see if I could get anything started on my own. I had a few experiences to share: I saw a sister missionary who looked Polynesian so I went up to her to talk to her and attempt to witness. She was from Kahuku, on the same island that I grew up on. She was nice enough but seemed very distant and as soon as a group came along who were ready for their tour, she left. I sat down for a little while and just prayed for the next one, and it was then that I saw a family who had several children, one of whom was in a stroller and had just made a poopy diaper. The parents had him laying in the stroller with his bare bottom hanging out, removing the diaper and trying their best to clean him up while kicked and rolled. After successfully removing the awful diaper, I figured their hands were probably nasty, so I grabbed my antibacterial hand wash out of my purse and went up to them. They were very shocked, but grateful and accepted it and of course, noticed my cross and were looking somewhat scared of it. I tried engaging them a little, but after a few attempts, I could tell they were just too freaked out, so I let them go. I pray that God will use that small encounter and that antibacterial stuff to bring them into His kingdom! Once the rest of the team got there, we found some missionaries to give us our tour. We got sister Wu from Taiwan and sister Flores from El Paso, Texas. During the tour, I noticed that sister Wu seemed much more enthusiastic than sister Flores. At one point of the tour when we are in front of their large Christus statue, there was a lady who was somewhat extravagantly dressed who looked Polynesian who was in the back just sobbing. Our whole team kept watch on her throughout the rest of the tour. When it was over, I noticed she was off on a couch by herself, so I took the moment to go up to her and ask her if she was from Hawaii. Her name was Bai and she was Philipino and said she had no permanent home, she just traveled around. It turned out that she was a Unitarian Universalist and when I asked her why she was crying, she told me that she just thinks all religions are so beautiful and that she thinks that the god of Mormonism is the same god of Christianity and Islam and every other faith and she was just touched by how she saw god in all religions. As I started to try to talk to her, my teammates told me later that they saw her LDS friends who she was there with start to circle and were getting very nervous. They called some LDS security, but then waited a few minutes. Just as I was starting to try to explain a few things to her, her friends came in and interrupted and tried to start answering my questions for her. The older man was giving me some super lame answers and when I challenged him to show me his beliefs from the Bible, he gave me a wrong reference, but assured me it said that in the Bible. He called the sister missionaries over to show it to me in the Bible, but they said they didn’t have one. (they used the lame excuse that it was just too heavy to carry around.) I told him that since he had served a mission too, he should know where to find it. He told me it had been over 20 years, but I joked with him and asked him if he should stop reading his Bible just because he’s not on his mission. He quickly took Bai and left. Then later, as we were going downstairs, we ran into our tour guides again, so I asked sister Wu if she was the only LDS in her family because she had said in the tour that she became LDS only 7 years ago. She said she was the only LDS and so I asked her what the rest of her family believed. She said they were Taoist and so I had her explain that to me. I told her she must be pretty passionate her faith then, because she was willing to endure all of them rejecting her, and she told me some of the mean things they have said to her because of converting to LDS. I told her I could relate because I was the first Christian in my family too. Then I started to tell her about some of our recent talks with LDS missionaries in our home and I went into talking about the LDS doctrine of repentance and some of our impossible gospel verses. After a little while, sister Flores joined us and so did Rosanne and Shayla. Rosanne started jumping in and sister Wu then focused on her, and sister Flores focused on me. I could tell from watching her responses to my questions about their verses that she was thinking and the glossy look in her eyes came and went as she had a harder time dealing with me. Everything was always very friendly and cordial, but I kept telling her over and over that if Mormonism was true, there was no hope for me or anyone else to ever have a way out of our sins. She had no answers. Sister Wu came over and took her after awhile and said they had to go to their next assignment for the day, but we took pictures together and parted on good terms. The rest of the team wanted to go visit the church museum, but I opted to just sit on the couch while they did that because of all the walking involved, so I got out my notes and prayed and asked God to help me prepare my talk for Thursday morning that I had almost no work done on, and even in there, in that yucky place, He answered my prayer and I got 80% of it done by the time the team came back to get me! Next, we went over to Pastor Dave Robert’s house for a wonderful supper and communion service. He prayed over each one of us individually and had some incredible discernment in his prayers over what each person needed personally, even though he hardly knew them. I also got to see a good friend of mine named Danielle, who is a former Mormon, who used to live in San Antonio. God helped me to disciple her and she has now moved back to SLC. Our next stop was Bill and Tammy McKeever’s house to bed down for the night. They are wonderful hosts and we were all very comfortable and were able to get a good night’s rest after our long day of travel. We spent a leisurely morning at the McKeever’s house. I enjoyed a good brisk walk in the cool Utah morning air. We left there around 11am and headed to Provo, UT where we ate our traditional lunch at Sizzler and then spent some time shopping for things we needed at the bookstore and grocery store. James and Jim took off down to Manti in James’ car to get our tent permits before 5pm, but Keith, myself, Rosanne and Shayla went to a large thrift store to get some things we needed for the colder weather that we were experiencing. We all met down at the park to set up camp around 6pm, got our tents set up and then went to Wal-Mart to get the rest of our needed supplies. As evening approached, Keith drove me to the home of Junelle and Darin Jacobson, where I would be staying this time because of my being so far along in my pregnancy. It felt strange to say goodbye to Keith and not be at camp with the team, but at the same time, I am very grateful not to be sleeping on the ground in a tent in this condition! Today I woke up at 5:30 and could not get back to sleep. I know it was largely because I am speaking this morning, so I was thinking about that way too much. We had our first training session at the church starting at 9:30 with praise and worship, prayer, an ex-LDS testimony, and then my talk. I entitled it “Dumb it Down for Becky.” I wanted to really try to help the new folks to know just what it’s like when we get out there on the streets with some real practical do’s and don’ts. I also taught through our impossible gospel method. It’s a good thing I made it very simple, because there were so many new people I could hardly believe it. Also, the place was packed. Normally, on the first Thursday, the church would be half empty, but not this time. To God be the glory! We went back to camp and just had snacks for lunch and spent the afternoon preparing for the evening through some role-playing and discussion. Most of what God had for me on this night was right in the beginning. The Christians usually gather around 6pm for some praise and worship by a lightpole right in front of the temple. This serves two purposes: 1) to help us get our hearts right before the Lord and 2) to expose the LDS people to what real worship and prayer are like. We always have LDS people walking by and gawking/mocking. Being that I need to stay off of my feet a lot this year, I set up my chair a ways back from the group so I can just listen to the music and pray, and also it has become my mission to watch the reactions of the LDS people to see if there’s anyone that needs talking to. I noticed an LDS volunteer lady who was situated right near the music who seemed to really be enjoying the music, so I decided to approach her. I took with me a music CD from our church’s music ministry in San Antonio. CBC donates lots of CDs every year to the mission field, so we brought a box of them with us to be able to give out to anyone. I went up to her right after the singing and told her that I noticed that she seemed to be really enjoying the music, so I wondered if I could give her a gift? She was shocked, but said sure. She gratefully took the CD and told me her name was Tammy. We chatted pleasantly for a few minutes and then I went back to my chair. After a little while, she came and brought her chair and sat next to me and we began to talk. She was very happy-go-lucky LDS lady who told me that she thought that all faiths were great and that she enjoyed what each one of them had to offer. She then started to ask about us and what group we were with. 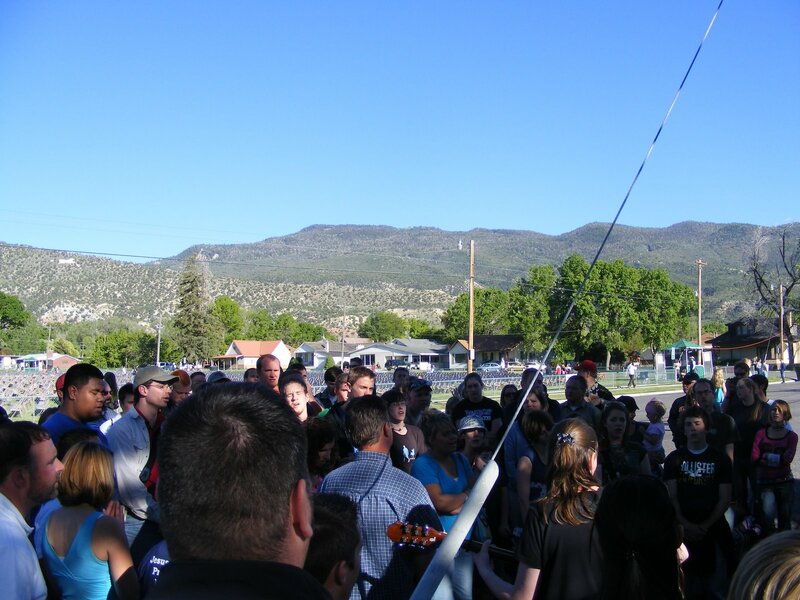 I explained to her about how we were all from many different churches and denominations, but that we all came together in Manti to share the love of Christ with the LDS people. She seemed intrigued and then asked why we had been coming so many years. I told her that Keith and I are full-time missionaries to JWs and LDS. This got her attention and she told me that a JW lady had been visiting her monthly in her small rural Utah town for some time now. From there, I knew where I wanted to go. I wanted to explain some things about JWs that would shock her and then use that to segway into talking about LDS beliefs. 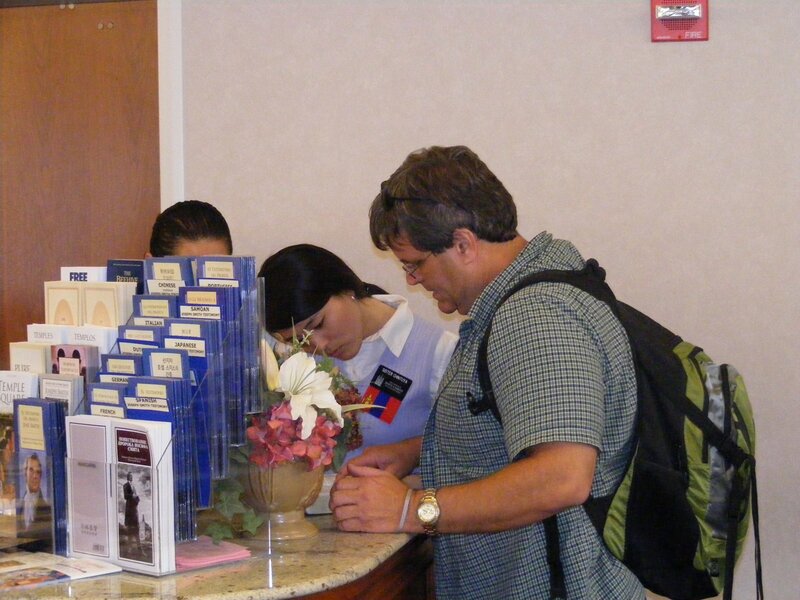 We spent about 20 minutes talking about the JW Jesus, blood transfusions and organ transplants, and then just as we were starting to wind that up, she had to leave and go assist some handicapped people (what she was there volunteering to do) I had managed to say a few things about really needing to check into things and study them out, but I never got to really address some of the LDS issues I wanted to. I was a little frustrated, but I am just trusting God to use that music and maybe something I said to plant some seeds in her heart. The next lady was named Kay Jensen. Not too long after Tammy had to leave, Kay came up from behind me. I had parked my chair right in front of the EMS tent (kinda funny, given my condition!) and she came up to me and asked me if I was with that group from Ephraim church of the Bible. (referring to where they had been singing earlier) I told her I was friends with all of them, but that I was here from San Antonio, TX and Community Bible Church. Again, I explained about all the churches and denominations represented in that crowd she saw. She seemed intrigued and then just burst in and said “I have so much respect for the people at Ephraim Church of the Bible.” (ECB) This was a major shock to me, so I asked if she was LDS. She said she was but she couldn’t say enough about Chip and Jamie Thompson. (these are the folks who founded the church and now run the college ministry) I asked her what had happened with them and her then, in a hushed voice, she told me about her son. She said that he had been an inmate in the local prison. When he was getting near the time to get out of prison, there were many things that he needed help with in order to get acclimated back into normal society. She told me that she went to all her LDS church leaders to try and get help for him and no one would help him in any way. Then she mentioned the prison ministry that ECB does there and that Chip and Jamie personally did so many things to help her son. She just went on and on and said that she wanted to say hello to them and asked if I could show her where they were. I showed her where they were, but then she started asking me about my pregnancy. As I was telling her about my C-section scheduled for July 14, she went and got some paper at the EMS tent and wrote down her name and cell number, told me she was an RN, and then told me very adamantly and sincerely that if I had ANY problems or needs during my time in Manti that I could call her day or night and she would help me. I felt very comfortable and comforted by her gesture of love and told her that I would and that she was an answer to my momma’s prayers! J She then had to leave, but I asked her if she would be there at the EMS tent any other nights, and she said almost every pageant night, so I plan on talking to her some more. This was all just so invigorating! The rest of my evening was spent in prayer and encouragement of other believers. Some became discouraged and came to me for prayer, so I enjoyed sitting in my chair and praying for them and seeing them come back later and tell me about the Mormon they had just had an opportunity to share with.